The SOAK Halyard Clip ensures that your spinnaker will not launch itself while sailing upwind and that the halyard will not get in the way during tacks and maneuvers. 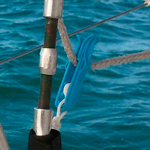 The Halyard Clip automatically releases during a spinnaker hoist so you do not have to remember to un-clip it. I'm using this in place of Velcro Halyard clips because it is MUCH easier to reset the halyards during a race or difficult conditions.